Even though she was born and raised in Detroit and attended Detroit Public Schools, Danielle Henderson wanted something different for her son. School choice has never been more popular in Michigan. Like Danielle, parents throughout Michigan are taking a close look at all of their educational options to find the best fit for their children. This year, more than 150,000 Michigan schoolchildren attend public charter schools. Another 110,000 students use “Schools of Choice,” a state program that allows them to attend public schools outside of their home districts. Overall, close to one out of every five Michigan schoolchildren rely on some form of educational choice to attend a public school. Despite this popularity — or perhaps because of it — entrenched special interest groups and some Democratic legislators have aggressively pushed to limit school choice. 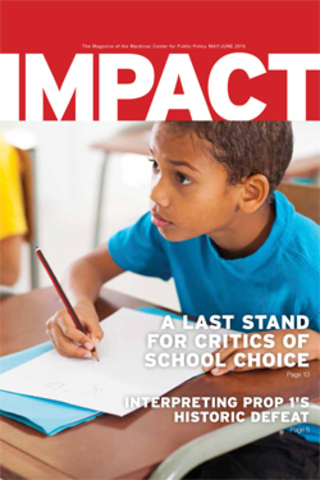 A statewide effort to limit school choice was a major part of the 2014 November election campaign. During the campaign, some state legislators called for a halt in the growth of charter schools, and even introduced legislation that could have eliminated charter schools altogether. Though those efforts were unsuccessful, there is now a new push to limit school choice in the city of Detroit. At the end of March, a collection of Detroit-based nonprofits and interest groups called for spending $53 million in state taxpayer money each year to pay off some of DPS’ debt. The coalition also proposed creating a bureaucratic commission to oversee all schools in Detroit, including the Detroit Public Schools district, and the city’s 66 charter schools. This new commission would have the power to unilaterally close schools, and could forbid new schools from opening. Though some critics of choice suggest that parents do not know how to make the right educational choices, Detroit parents say they can see the difference in school quality, and the power of choice is one that cannot be taken away. “We know what’s best for our kids,” said LaTanya Dorsey, who sends her daughter to a charter school in Eastpointe. However, proposals to limit school choice in Detroit are gaining some traction. Most recently, Gov. Rick Snyder has proposed his own fix for Detroit. His proposal contains several portions of the coalition’s plan, including spending as much as $72 million in state taxpayer money to pay off DPS debt. Further, the governor’s proposal would create a “Detroit Education Commission,” which would have the power to unilaterally close schools, or forbid new schools from opening — a recommendation that looks very similar to what the nonprofits and special interest coalition has proposed. As the debate over how to solve the problem of Detroit Public Schools continues in Lansing, it is critical that Detroit parents’ voices are heard. To this end, the Mackinac Center interviewed 12 Detroit-area parents who have chosen public charter schools about the importance of school choice. You can watch these videos at Mackinac.org/OurChoice. These families say that having educational choice is invaluable. Many of these families, like Danielle Henderson, have experience with DPS, and want to give their children something better. Tamika Harrison, a Detroit mom, pulled her son out of Detroit Public Schools because of what she heard while working as a school bus driver. “I dealt with a lot of teachers, and didn’t like some of the attitudes,” she said. Tamika’s son now attends a charter school. “I love the academy schools. I love the teachers. I love how they are into the students,” she said. In fact, educational choice is allowing Detroit-area parents to move back to the city. One parent, Toya Putnam, a mother of two boys, chooses to send her seven-year-old son to a Detroit-area charter school in Roseville. Putnam and her family are moving back to Detroit from Warren, and her son will continue to attend the Roseville charter school. The move is possible for her family, Putnam says, because she will still be able to send her son to the school that is best for him. “My husband and I decided that we would not place our children in public schools unless the curriculum meets our personal requirements,” she said. Nancy Clark, a grandmother, lives in Inkster, but sends her grandchildren to a Detroit charter school. Nancy visited a DPS high school, and says she “was horrified at the fact that [students] had to go through metal detectors.” Particularly disturbing to Nancy was the way students were behaving, with no apparent adult supervision. As legislators, state officials, and interest groups debate how to address Detroit Public Schools, there is a possibility that parental choice will be limited. But the good news is that educational choice is on the rise. Indeed, every new child using Schools of Choice or attending a charter school will make it more difficult for critics to take away the choices parents have. With more than 260,000 Michigan students relying on educational choice, critics have likely realized that they must act now to limit it, before its growing popularity makes the task impossible. In many ways, the last eight months can be seen as choice critics’ last stand. Not only are critics trying to limit parental choice, they are trying to limit a system of schools that produces better academic results. Stanford University has highlighted Detroit’s charter schools as a model for other urban areas, because Detroit charter school students learn more than their conventional school peers. We cannot let these positive changes be reversed. During the next few months, the Mackinac Center will work to make sure that the voices of parents, like Danielle, LaTanya, Janine, Tamika, Toya, and Nancy are heard.